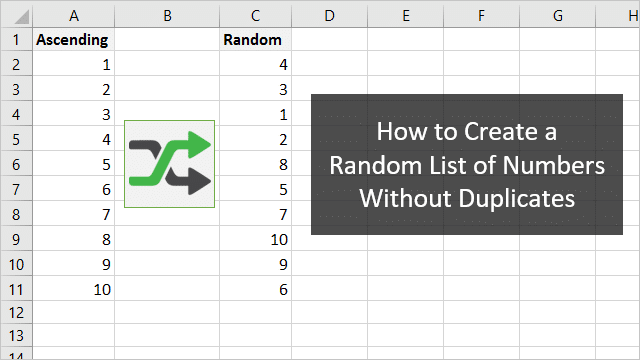 Bottom line: Learn how to create a list of unique random numbers with no duplicates or repeats. My friend and fellow blogger, George Mount, posted a question on Facebook yesterday about creating a list of random non-repeating numbers. So how else can we solve this problem…? One simple way is sort a list of numbers in random order. We can do this by creating a list of numbers, adding a column of random numbers with the RAND function, and sorting the column. Here is a quick screencast that shows how to create the random list. Checkout my posts on shortcuts for Ctrl+Enter and the Fill Handle to learn some of the fill techniques I used in the screencast above. Here are detailed instructions on how to create the randomly sorted list of numbers. The first step is to create a list of numbers in sequential order. This can be 1 to 10, or 1 to 1,000,000, or anything in between. We can use the Fill Handle to quickly create this list in a column. We can also use the Fill Series menu to create the list by specifying the stop value (upper limit). The Fill Series tool is much faster than dragging the fill handle down hundreds or thousands of rows. We now need to create another column of random numbers. We can use either the RAND or RANDBETWEEN functions for this. The RAND function is the fastest because we don't have to specify any arguments. 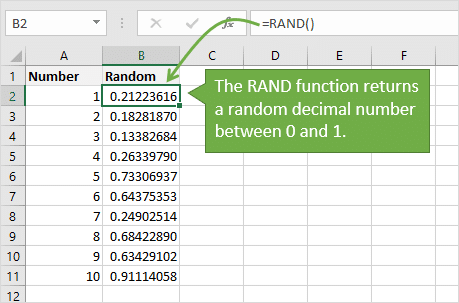 The RAND function returns a random decimal number to the cell. Input the formula =RAND() in the first cell and double-click the fill handle to copy the formula down. The last step is to apply filters to both columns and sort the column that contains the random numbers. Since this column is random, the sort order applied to the first column will be completely random. The first column now contains a list of unique numbers in random order. It's important to note that both the RAND & RANDBETWEEN functions are volatile. This means they recalculate every time Excel calculates, regardless of any formula dependencies. So, each cell that contains a random function will generate a new random number every time you make a change to the workbook. This includes applying the Sort to the range. To prevent this, we can copy/paste values on the column of random numbers after copying down the formula. This same technique can be used to sort lists of names or text in random order. In the following example we have a list of names in alphabetical order. 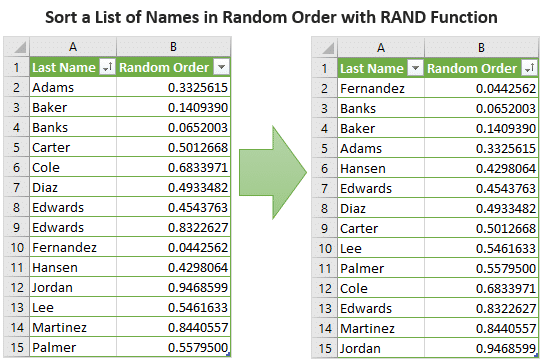 We can add random numbers in column B using the RAND function, then sort the range by column B. This will put the names in column A in random order. My friend Oz du Soleil from Data Scopic had a great suggestion for creating a list of random numbers when you do NOT need to include every number in the range. For example, let's say we need a list of 100 random numbers between 1 and 1,000. His suggestion was to use the RANDBETWEEN function to create a long list of random numbers. Fill the formula to more than 100 cells, then copy/paste values. Then use the Remove Duplicates feature to remove any possible duplicates that are generated by RANDBETWEEN. That will leave us with a long list of unique random numbers. We can then delete an extra cells that we do not need. Maybe Oz can create one of his awesome Excel on Fire YouTube videos to explain this technique in more detail. Use Rand or Randbetween. Then choose REMOVE DUPLICATES from the menu. Hello I’m trying to do a project but I need a number generator the generates multiple numbers that don’t have any repeating numbers in the number and I want no repeating generated numbers do you get what I’m saying if so can you try to do it for me thanks! I wonder how you make the red progress bar at the bottom of each gif picture? Super simple solutions, have helped me, thanks a lot! I am facing a problem in generating random number, for example randbetween(1,412) and i want to get 101 random numbers. But problem is repeating the numbers. So how I tackle this problem? Thanks a lot for the helpful article. It is also my belief that mesothelioma cancer has an extremely long latency phase, which means that the signs of the disease may well not emerge until eventually 30 to 50 years after the original exposure to mesothelioma. Pleural mesothelioma, which can be the most common style and has an effect on the area around the lungs, could cause shortness of breath, chest pains, including a persistent coughing, which may result in coughing up bloodstream. Thanks for the shout-out and well-crafted post, Jon! Good Idea. Thank a lot. I have a list of numbers from A1:A100. Now I would like to repeat the SAME 100 numbers with a different (random) order 1000 times (some kind of simulation) in column B, C, ….. every row being random but using all of the 100 numbers from A1:A100. (in case the info is needed: the numbers are some kind of returns varying between (0;0,5) & (-1) appearing once in a while). My Q is i have 60 teams and i would like to randomize the teams into 20 folds each 60 times with a team not repeating it self with in the same folds.i need the formula to use in excel for that purpose.can u derive a formula for me.THANKS AND HOPE TO HEAR FROM U SOON. This solution was the product of a heavily constrained working practice. 3. Avoid the use of helper ranges unless they contain information meaningful to the end user. It is the fact that p is an array constant that produces a sequence of ranges. If you substituted for all the names you would eventually get a single nested formula but it most likely would be horrible. This approach based upon named formulas allows the solution to be built step by step almost programmatically. I would like to randomize non sequential numbers with a range from 1 through to 40. Example: 1, 2, 4,7,8,9,11,14,17 …..40. Twenty four numbers in total. Randomize in groups of 6 without duplicating a number in a group. This is for training drills in 7 different applications ensuring each application has four new groups of 6 every time to ensure fairness. and fill down to C11. We may also use the function SMALL instead of LARGE. Then press DEL repeatedly in any empty cell. Voilà! We may also put any text in the range A2:A11 to create a list of non-repetitive random texts. hello, please I have an assignment on UIS, could you please of help? Thank you so much Sir. Your Excel tips are always useful. I tried this but got #NUM! error. Any thoughts on what could be causing that? Thanks john, very very useful tips…. Here is an article on an explanation of VLOOKUP. That article has additional links. I also have a free 3-part video series on the lookup formulas including VLOOKUP and INDEX & MATCH. Thanks! I dearly want to do this but I do not want it to be a decimal. Is there an easy way to convert it to a whole number with no decimal or best to create whole numbers to begin with? This technique does use whole numbers. We are just using the RAND function to sort the list of whole numbers in column A. I hope that helps. Thanks Jon, your posts are always helpful. There is something I was hoping you could help me with. I have been trying to find out how a total beginner can start the journey of becoming an MCT. The website shows a lot of details but I find them very confusing. I will be grateful if you could help. I use the INT() function in combination with the RANDBETWEEN() function to create a list of random whole numbers (e.g. =int(randbetween(20,100)), then I copy/paste values in another range, so I have the original random numbers and finally I use the remove duplicates from the Data Tab => Data Tools Group. RANDBETWEEN only creates whole numbers, so you probably do not need the INT function in that formula. In the seventies of the last century Excel was not available. I used FORTRAN. For a simulation program I needed to produce many series of unique random numbers of 1 to N. I wrote a subroutine to get these series. First, an array would be filled with the numbers 1, 2, …, N. The number of remaining random numbers M would be set to N. The number of random numbers, lets call it J, would be set to 1. Then I would draw an integer random number between 1 and M. Lets call it I. The I-th number of the first array would be entered into the J-th location of the output array. The M-th number of the first array would be copied into the I-th position of the first array. I := I+1, J:=J+1, M:=M-1 and the above would be repeated in a loop until M=0. The output array would then contain the numbers 1, 2, …, N in random order. No checking on duplicates, no checking on missing numbers, and no sorting needed. It was an extremely fast method. To imitate shuffling a card deck, you would use N=52. You can easily write an Excel macro doing the same. The post was a wonderful example of ‘thinking out of the box’. Fill series, just hiding in plain sight! I will definitely explore that a bit more this week. Thanks John! Haha! I totally agree. It’s a great little feature that I often forget about too. Here is the MSDN Help Page that explains more about each option in the menu. The info about it towards the bottom of the page in the section titled, “Fill cells with a series by using the Fill command”. Linear – Creates a series that is calculated by adding the value in the Step value box to each cell value in turn. Growth – Creates a series that is calculated by multiplying the value in the Step value box by each cell value in turn. Date – Creates a series that fills date values incrementally by the value in the Step value box and is dependent on the unit specified under Date unit. 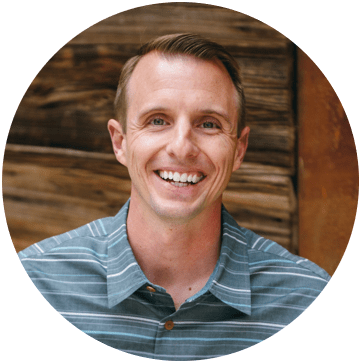 AutoFill – Creates a series that produces the same results as dragging the fill handle. There might be a solution using Goal Seek together with a helper column next to the column in which the unique random numbers are entered. The helper column uses CountIfs function to find any duplicates. The sum of the helper column must equal the number of unique values, finally. Goal Seek uses the sum cell of the helper column as the “Set Cell”. The “To value” is the number of unique values needed. The “By Changing Cell” can be any empty cell in the worksheet. With 100 random values I got it managed within two or three trials. I increased the number iterations to 1000. So lees trails were needed. Quite a workaround but still having some automatic calculations. Thanks so much Jon, love the tips for this easy to use function!! !